Last night I looked through my fruit and found a ton of apples that were past the pretty stage. They were downright wrinkly and I knew not one person in my family would touch them! But under that wrinkly skin was a perfectly good apple. So I peeled them all, chopped them into chunks and threw them in the fridge to use later. 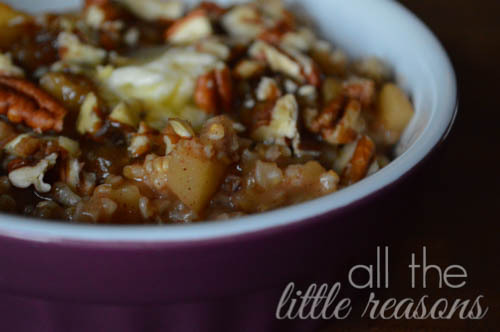 This morning I decided to use the first batch on apple oatmeal and came up with this recipe. This part is optional, but I think it really deepens the flavor. Put the steel cut oats into the pan and turn heat to low. Keep stirring or tossing around until it smells nutty. 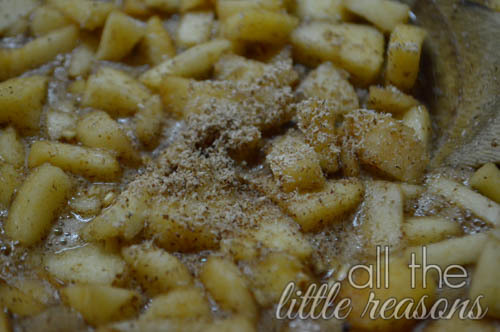 Then add apples, water, cinnamon, salt and nutmeg. 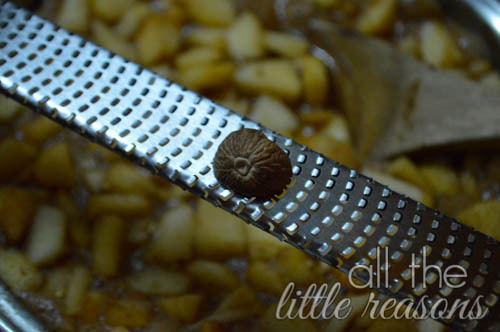 I usually use a whole nutmeg and grate it on my microplane. 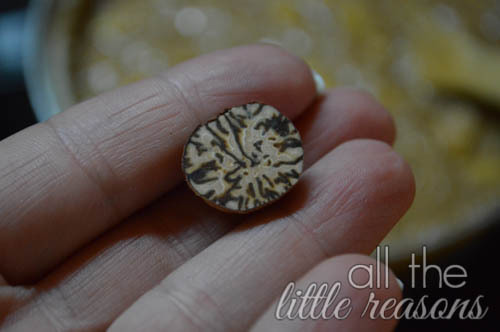 This is what a whole nutmeg looks like. They last forever! I’ve probably used this particular one in at least 4 recipes and there’s still lots more. Since I don’t measure it, so I used about this much in the recipe (see below). 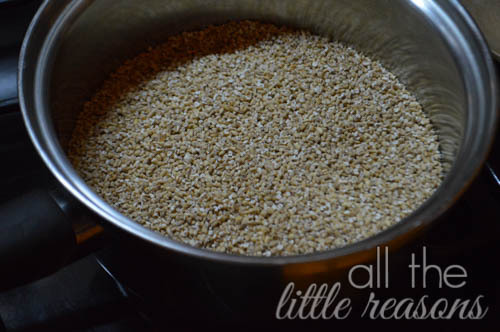 Bring to a boil, then reduce heat and cook about 15 minutes, or until steel cut oats are done. It’s hard to judge time on this because everyone likes the texture a little different. I like it still a bit chewy. 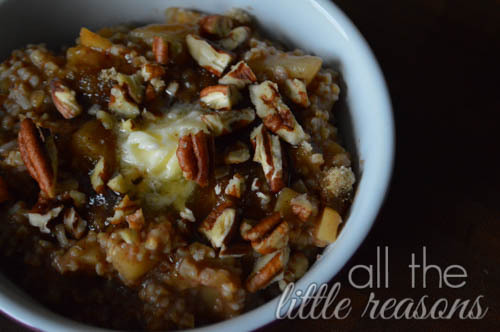 You could also make this in the crockpot if you want an instant breakfast. Add all the ingredients and set to low overnight. Turn it on as late as possible because it gets mushy if it cooks too long! 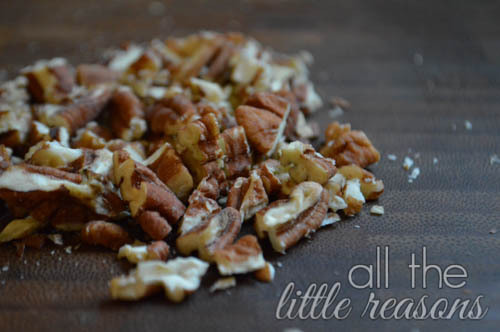 I top mine with brown sugar, chopped pecans and a pat of butter. It’s so delicious! I hope you love it! Add all the other ingredients and bring to a boil. 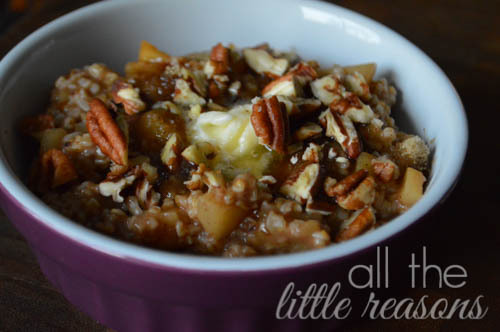 Turn down heat and cook for about 15 minutes, or until steel cut oats are tender. I find that they are a bit chewier this way than when I cook them in the crockpot. You could throw all this into a crockpot and turn on low overnight if you'd like to eat immediately in the morning. Top with brown sugar or stevia, chopped pecans and a pat of butter. So delicious!